Le Guerneve, C., Becquer, A., Torres-Aquino, M., Amenc, L. K., Trives-Segura, C., Staunton, S., Plassard, C. and Quiquampoix, H. (2018). In vivo and in vitro 31P-NMR Study of the Phosphate Transport and Polyphosphate Metabolism in Hebeloma cylindrosporum in Response to Plant Roots Signals. Bio-protocol 8(16): e2973. DOI: 10.21769/BioProtoc.2973. We used in vivo and in vitro phosphorus-31 nuclear magnetic resonance (31P-NMR) spectroscopy to follow the change in transport, compartmentation and metabolism of phosphate in the ectomycorrhizal fungus Hebeloma cylindrosporum in response to root signals originating from host (Pinus pinaster) or non-host (Zea mays) plants. A device was developed for the in vivo studies allowing the circulation of a continuously oxygenated mineral solution in an NMR tube containing the mycelia. The in vitro studies were performed on fungal material after several consecutive treatment steps (freezing in liquid nitrogen; crushing with perchloric acid; elimination of perchloric acid; freeze-drying; dissolution in an appropriate liquid medium). 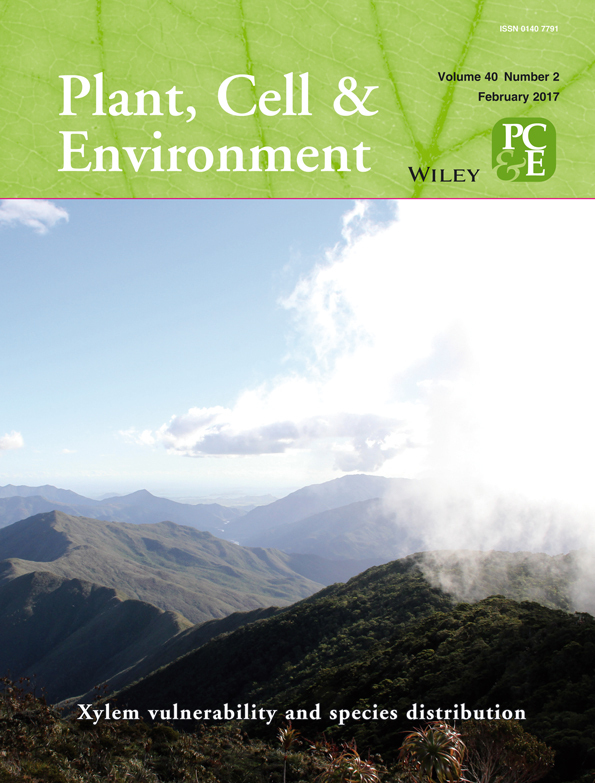 The association between mycorrhizal fungi and plants improves the P nutrition of the host-plant (Smith and Read, 2008; Plassard and Dell, 2010; Cairney, 2011; Smith et al., 2015). This positive effect has been attributed primarily to phosphate (Pi) uptake by the fungal hyphae exploring a large volume of soil beyond the depletion zone around actively absorbing roots (Smith and Read, 2008; Cairney, 2011; Smith et al., 2015) and to the secretion of extracellular phosphatases by the fungal cells (Quiquampoix and Mousain, 2005). Absorbed Pi is partly incorporated into phosphorylated metabolites, phospholipids and nucleic acids, and partly condensed into polyphosphates (PolyP) where they constitute a storage pool in the vacuoles (Ashford et al., 1994). This protocol details a device that allows the study of Pi transport in fungal cell compartments and metabolism of PolyP by 31P-NMR spectroscopy. Mycelia are incubated without plants, with host plants or with non-host plants (Torres-Aquino et al., 2017). 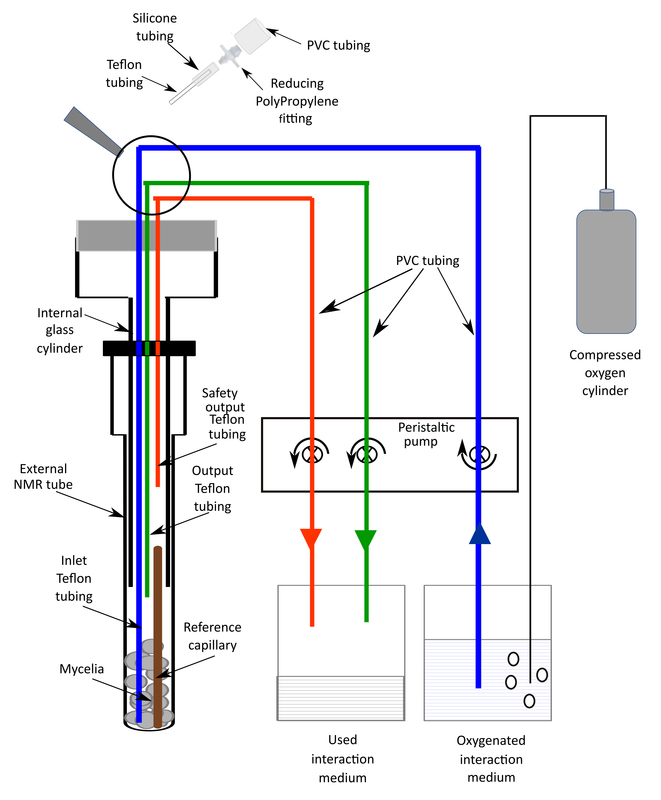 For the in vivo studies, this perfusion system permits the circulation of an oxygenated nutrient solution in an NMR tube so that the risk of liquid leakage in the NMR spectrometer is prevented. The in vitro studies are based on the perchloric acid extraction of the fungal mycelia. This protocol could be used for other fungal or plant species. Mycelia were grown in glass jars according to the procedure previously described in Bio-protocol (Becquer et al., 2017a). The procedure for disinfection of seeds, germination and culture conditions have been previously described in Bio-protocol (Becquer et al., 2017b). Sterilize the surface of seeds of maize (Zea mays L.) with a 6% H2O2 solution for 30 min and rinse with sterile distilled water. For germination, put the seeds between two sterile sheets of filter paper previously wetted with deionized sterile water. Incubate for 6 days at 30 °C in the dark for germination. Transfer the seedlings to the test tubes filled with a 0.2 mM CaSO4 solution (35 ml/tube) for 3 days in a growth chamber chamber under 16/8 h light/dark cycle at 25 °C/20 °C, 80%/100% RH, CO2 volume fraction in air of 350 x 10-6 and a photosynthetically active radiation of 400 μmol m-2 sec-1 (400-700 nm). Then, take the test tubes under a flow laminar cabinet to replace the CaSO4 solution by 35 ml of interaction medium (see Recipe 6) in each test tube. Return the test tubes into the growth chamber for an acclimatization period of 24 h.
To study the plant roots signals eliciting a specific response of the fungal mycelia, follow the incubation procedure previously described in Becquer et al. (2017b). A wooden skewer with a hook made with a nichrome wire at its end. A glass capillary for the reference of chemical shift of NMR spectra (16.38 ppm), filled with a solution of methylene diphosphonate (MDP) 50 mM in Tris buffer 30 mM at pH 8.9 (see Video 1 how to prepare the capillary). An external NMR tube (10 mm diameter). An internal glass cylinder (7 mm diameter) which can be screwed on the external tube. A plastic cap on the top of this device which is bored to allow 3 Teflon tubings to connect the NMR tube to a peristaltic pump permitting the circulation of the oxygenated interaction medium. The inlet tubing extends to the bottom of the NMR tube. The output tubing extends to the top of the mycelia in the NMR tube. The end of the safety output tubing is 3 cm above the mycelia. A string is attached to this device to allow its manual introduction into the hole in the magnet of the NMR spectrometer without using the air-lift system, to avoid friction between the 3 PVC tubings and magnet walls. A system that allows the circulation of the oxygenated interaction medium into the above-described tube, avoiding anoxia of the mycelia during the NMR data acquisition. The 3 Teflon tubings extending from the NMR tube that are connected to a peristaltic pump through PVC tubings. The inlet tubing supplies the interaction medium from a glass bottle (2,000 ml), in which oxygen is bubbled from a compressed O2 gas cylinder, to the NMR tube. The output tubing collects the medium which has oxygenated the mycelia to another originally empty glass bottle (2,000 ml). In case of dysfunction of the normal output system, a safety output tubing should avoid any leakage in the magnet hole. Remove the fungal mycelia from the flask, or from the syringe containing interaction medium (see Becquer et al., 2017b), let the solution drip off gently and put it on a filter paper with the help of spatula or tweezers. Put the fungal mycelia at the bottom of the NMR tube, as gently as possible, using the spatula first and then the flat side of the wooden skewer. With Hebeloma cylindrosporum, three mycelial samples obtained in the above-described culture conditions are necessary for a reasonable signal to noise 31P-NMR of 1 h of fully relaxed data acquisition. Put the chemical shift reference capillary at the bottom center of the NMR tube with the help of the wooden skewer and the hook. Screw the internal tube on the NMR tube. If the reference capillary is not well positioned inside the internal tube, start again and move it with the hook to set it up in the middle of the internal tube. Roll a silicone film on the plastic cap to ensure that the oxygenated perfusion solution will not leak off the NMR tube. Start the oxygen bubbling in the glass bottle containing the interaction medium connected to the NMR tube via the inlet tubing. Adjust the flow controlled by the peristaltic pump of the inlet, output and safety output tubings to 9 ml min-1 for each of them. Introduce manually and slowly the NMR tube with the 3 tubings in the magnet hole of the NMR spectrometer with the help of the string. Freeze the mycelia with liquid nitrogen. Store them at -80 °C before extraction. For each 31P-NMR measurement, thaw 6 frozen mycelia at 4 °C and crush them with 1 ml of 70% (v/v) perchloric acid containing sodium vanadate 10 mM. Centrifuge the thick suspension at 10,000 x g for 10 min to discard particulate matter in the pellet. Transfer the supernatant into a 50 ml Falcon tube, add a pH electrode and neutralize the solution by very slowly adding a solution of 2 M KHCO3, allowing foam to subside, stop when a pH of 6.5 is obtained. Centrifuge again at 10,000 x g for 10 min to remove KClO4 in the pellet. Freeze dry the supernatant and store it at -80 °C. For the NMR measurement, the freeze-dried material is redissolved in 2 ml MOPS 40 mM (non-adjusted pH). Then add 0.2 ml EDTA 100 mM. 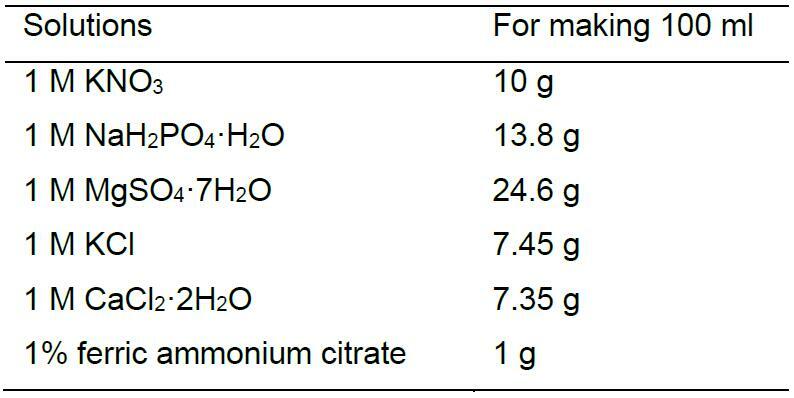 Adjust the pH to 7.8 with KOH 1 N.
Add NaN3 to a final concentration of 100 mg ml-1 to avoid microbial degradation. Add D2O (final concentration 10%) for the field frequency lock of the NMR signal. Record NMR spectra with a Varian UNITY INOVA 500 MHz operating at 202.4 MHz for 31P equipped with a 10 mm broadband probe operating at 25 °C. It was not necessary to optimize shims considering the broadness of 31P NMR signals in in vivo experiments. Carry out the experiments without a lock signal. 90° radio frequency pulses angle; spectral width = 20,000 Hz; acquisition time = 0.4 sec; 31P frequency offset = 3,900 Hz. No decoupling (not useful considering the broadness of 31P-NMR peaks in vivo NMR experiments: 1H decoupling does not affect the linewidths of peaks). 20 sec inter-scan delay (5 times the spin-lattice relaxation time T1) giving a fully relaxed spectrum (Quiquampoix et al., 1993). This is a very important parameter for the quantitative analysis of the chemical metabolites identified in the 31P-NMR spectrum. A much lower inter-scan delay does not allow a real quantification. 180 scans giving a total accumulation time of 1 h.
Apodization of the spectra using a 10 Hz exponential function and zero filling to 16 K points. Note: Examples of in vivo spectra obtained with this protocol can be seen in Torres-Aquino et al. (2017). 10% of D2O in the mycelial sample as a lock signal. 90° radio frequency pulses angle; spectral width = 9,600 Hz; acquisition time = 0.84 sec; 1H decoupling during the acquisition time using a Waltz-16 pulse sequence at a field strength of 4 KHz. 31P frequency offset = 4,900 Hz; 1H frequency offset = 170 Hz. 4 sec inter-scan delay. In these experiments, the scope is the identification of the phosphorylated fungal metabolites based on the signal chemical shift, without the need of quantification. If quantification is required, use the 20 sec inter-scan delay as for in vivo studies. A sufficient number of accumulations for an acceptable signal-to-noise ratio. Note: Examples of in vitro spectra obtained with this protocol can be seen in Torres-Aquino et al. (2017). NMR peak areas of Pi and polyP are expressed relative to that of the MDP capillary which is the same for all experiments and is arbitrarily fixed to 1. If you compare several treatments, test the normality of data using the Kolmogorov Smirnov test and, where necessary, transform the data either square root or log10 prior to analysis to meet the assumptions of the ANOVA. To compare the effect of treatments, use an ANOVA analysis followed by Tukey’s honest significance difference. For 31P-NMR measurements, data in percentage were transformed (arcsin√x) as described by Legendre and Legendre (1998) before ANOVA. As the growth of the fungus in liquid medium may vary, we prepare up to 4 additional culture flasks inoculated with the fungus to discard those with poor growth. If you need the assistance of a scientist who is in charge of an NMR facility unit, you will probably have to convince them of the safety of the homemade perfusion NMR tube for in vivo studies. Launch several distinct experiments with this device outside the NMR spectrometer to check that no leakage of liquid occurs. If an NMR spectrometer of lower magnetic field is used, the number of accumulations will have to be increased. The flow of oxygenated liquid medium in the perfusion NMR tube is a compromise between two unwanted phenomena: (i) a too low flow will not be sufficient for a good oxygenation of the cells and (ii) a too high flow will lead to bubbles formation in the matrix of the biological sample which causes a decrease in the spectral resolution. The latter effect usually does not appear below 10 ml min-1 (Lee and Ratcliffe, 1983). This research was supported by INRA (France) through a Young Scientist Contract granted to Adeline Becquer and by CONACYT (Mexico) through a Ph.D. fellowship granted to Margarita Torres-Aquino. The protocol is adapted from our previous work (Torres-Aquino et al., 2017). Ashford, A. E., Ryde, S. and Barrow, K. D. (1994). Demonstration of a short chain polyphosphate in Pisolithus tinctorius and the implications for phosphorus transport. New Phytologist 126(2): 239-247. Aubert, S., Gout, E., Bligny, R., Marty-Mazars, D., Barrieu, F., Alabouvette, J., Marty, F. and Douce, R. (1996). Ultrastructural and biochemical characterization of autophagy in higher plant cells subjected to carbon deprivation: control by the supply of mitochondria with respiratory substrates. J Cell Biol 133(6): 1251-1263. Lee, R. B. and Ratcliffe, R. G. (1983). Development of an aeration system for use in plant tissue NMR experiments. Journal of Experimental Botany 34(146): 1213-1221. Legendre, P. and Legendre, L. (1998). In: Numerical Ecology. 2nd edition. pp. 33-46. Elsevier Science B. V. Amsterdam. Quiquampoix, H., Bačić, G., Loughman, B. C. and Ratcliffe, R. G. (1993). Quantitative aspects of the 31P-NMR detection of manganese in plant tissues. J Exp Bot 44(269): 1809-1818. Quiquampoix, H. and Mousain, D. (2005). Enzymatic hydrolysis of organic phosphorus. In: Organic Phosphorus in the Environment, pp. 89-112. In: Turner, B. L., Frossard, E. and Baldwin, D. (Eds.). CAB International. Wallingford. Roby, C., Martin, J. B., Bligny, R. and Douce, R. (1987). Biochemical changes during sucrose deprivation in higher plant cells. Phosphorus-31 nuclear magnetic resonance studies. J Biol Chem 262(11): 5000-5007. Smith, S. E. and Read, D. J. (2008). Mycorrhizal symbiosis. 3rd edition. Academic Press, London. How to cite: Le Guerneve, C., Becquer, A., Torres-Aquino, M., Amenc, L. K., Trives-Segura, C., Staunton, S., Plassard, C. and Quiquampoix, H. (2018). In vivo and in vitro 31P-NMR Study of the Phosphate Transport and Polyphosphate Metabolism in Hebeloma cylindrosporum in Response to Plant Roots Signals. Bio-protocol 8(16): e2973. DOI: 10.21769/BioProtoc.2973.